– Dental caries are not evenly distributed throughout the mouth. – Certain surfaces of the teeth are particularly susceptible to carious lesions; others are nearly immune. – In the late 1800s, Dr. G.V. Black classified the most common sites for dental caries. – His classification system adequately describes most simple carious lesions. – In high-caries patients, a single tooth may have more than one lesion. – These lesions may be of the same class or of different classes. – At times, extensive lesions could be described as being a combination of two classes. – The pits and fissures of teeth, particularly posterior teeth, are the most susceptible to dental caries. 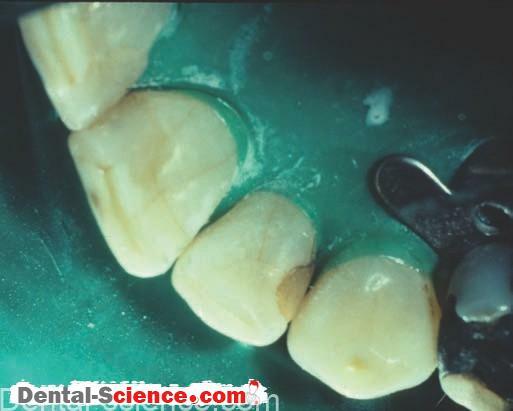 – Pit and fissure caries are called Class I lesions, and the associated restorations are called Class I restorations. 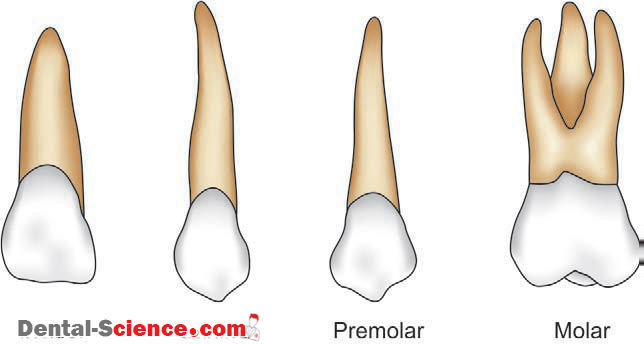 – The area of the tooth just below the interproximal contact is also susceptible to caries. 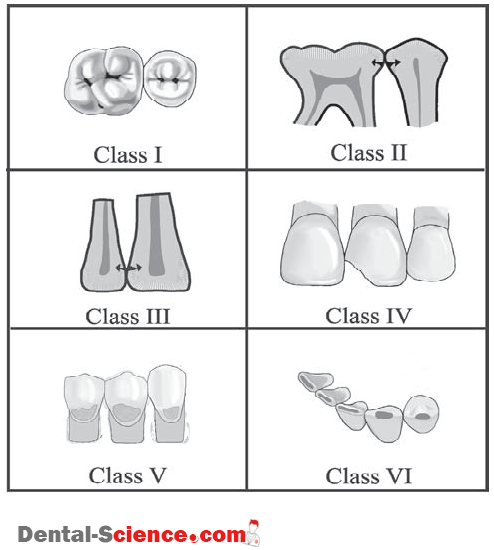 – If such a lesion occurs in a posterior tooth, it is called a Class II lesion. – Dental radiographs are commonly used to diagnose Class II caries. 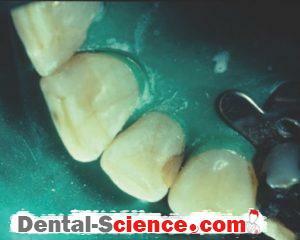 – If interproximal caries occur in an anterior tooth, it is called a Class III lesion. – Dental radiographs and clinical examination are commonly used to diagnose Class III lesions. 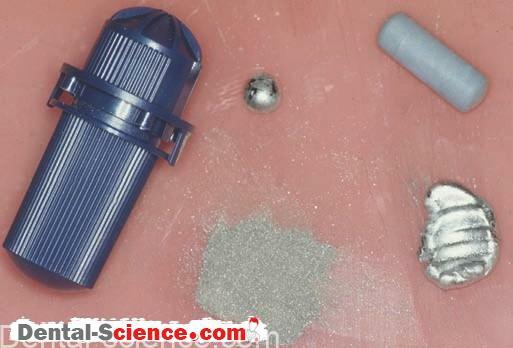 – Next picture show Class III caries and restorations. – A lesion that involves the incisal angle of an anterior tooth is called a Class IV lesion. – Class IV restorations are also used to restore the incisal angle of an anterior tooth that has been fractured as the result of trauma. 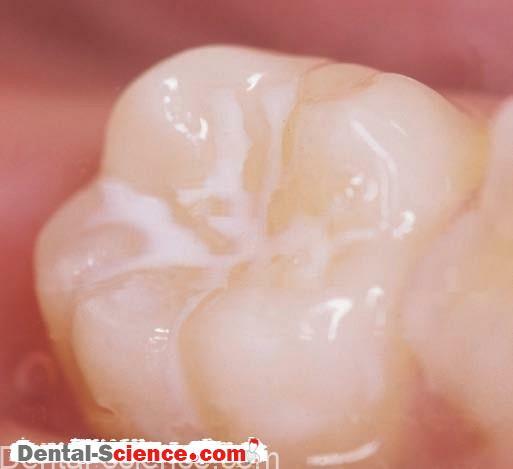 is susceptible to caries when patients have poor oral hygiene or a high-sugar diet. – The Class VI lesion was a later addition to Black’s classification. – A Class VI lesion involves the cusp tip or incisal edge of a tooth. – Actually, a Class VI carious lesion is quite rare. – For most people retaining a large number of teeth later in life, however, wear of cusp tips and incisal edges is not uncommon. – When attrition causes dentin to become exposed, it wears much faster than the surrounding enamel because enamel is much harder than dentin. – The result is a “dished out” area of worn dentin. – Some clinicians call these restorations of such worn cusp tips and incisal edges Class VI restorations.